My Computer Slow Sonny Boy Talk, Talk, Talk! Poetry books are often filled with poems you like and poems you don't like. That's why MyStoriesAndPoems let's you choose which poems you want for your poetry collection. 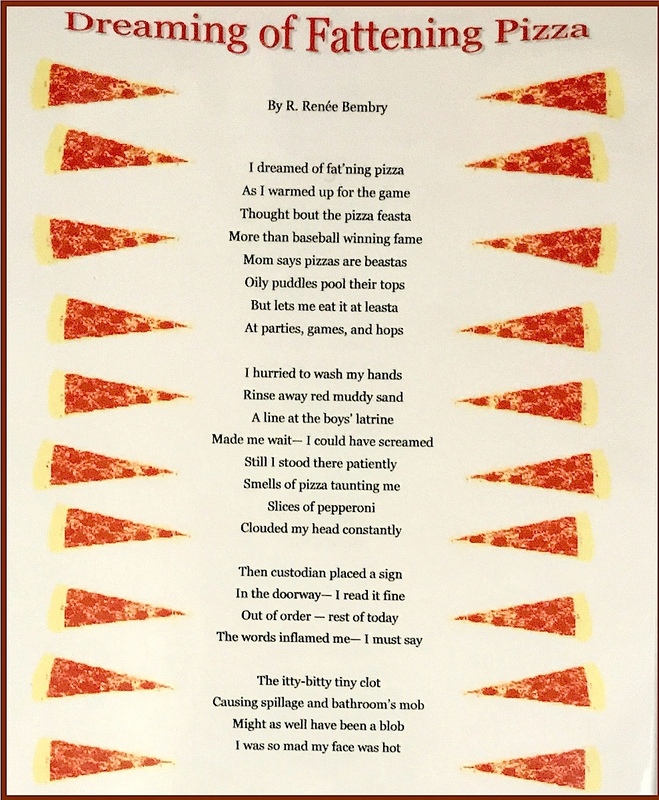 R. Renée Bembry creates all the Designer Poetry Pages found at this site, prints them on durable stock paper, and then carefully slips them into vinyl protective covers. While examining the poems near the bottom of this page, note that the Designer Poetry Pages only show portions of one-page, two-page, and in some cases, three-page poetic sheets. For purposes of showcasing the items on this website, MSAP calls these displays "Partial Poems" set in Designer Pages. Here are some Designer Poetry Page features and a few ideas of what collectors do with them. Ways to Collect or Display - Designer Pages are easy to preserve in decorative boxes or 3-ring binders. Storing poetry pages in decorative binders or boxes further protects the pages and makes sharing easy as kids grow their collections. These protective measures act as insurance policies to help for your kids' work last their lifetimes. In addition to storing them in boxes, however, you can also remove Poetry Pages from their sheet protectors and place them in frames for a wall. Hanging the pages adds extra flair to children's rooms when you order pages with their poems as well as "matching" pages with MSAP poems. 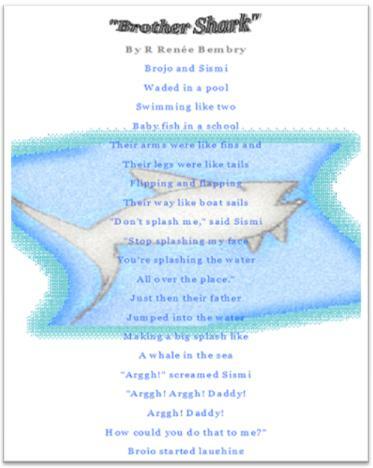 MSAP prints children's poems in the same designs as author R. Renée Bembry poems when children write to Theme-Stories found on this site as well as in poetry lessons beyond lesson three. 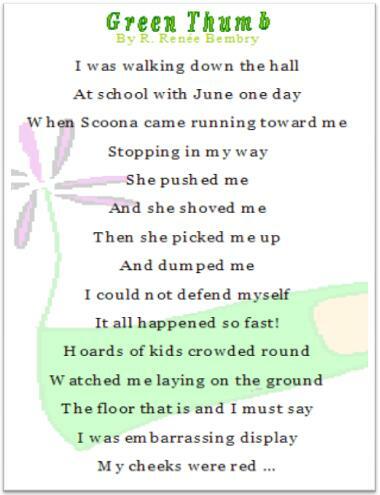 Get more info on Theme-Story 1 Grasshopper Lesson page. Once again - - - Complete poetic pages are only available upon ordering. * Designer Poetry Pages make great gifts for kids to give friends and loved ones. 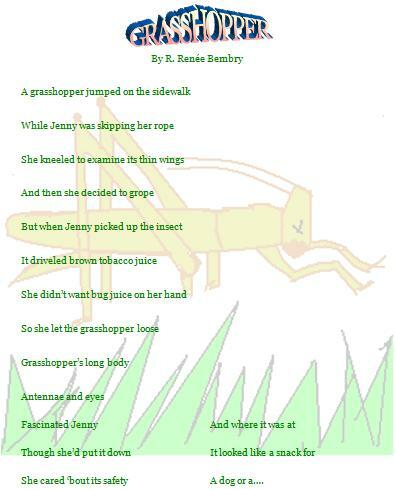 * Young authors can showcase their work side-by-side with R. Renée Bembry poetry pages. 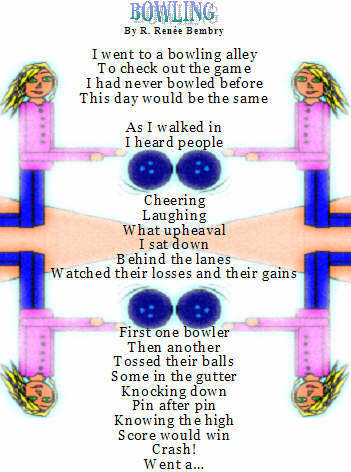 * Adults helping children improve their poetry-writing or who wish to have poems printed in designer pages for other reasons may do so when writing to MSAP Theme-Stories. Getting your poems embedded in her Designer Pages. Get more info about Designer Poetry Pages here. 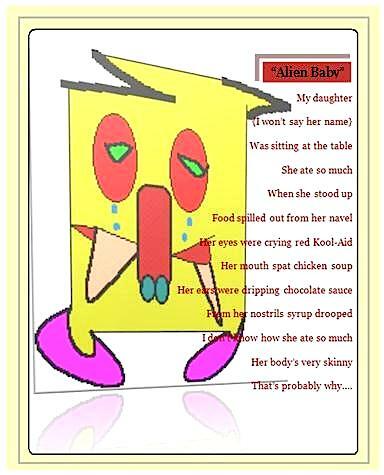 Poem about girl birthing an alien. Kid's dilemma getting to pizza table after his baseball ballgame. Be sure to check back for yours! Learn about hitchhiking bedbugs before you travel! All Content and all Images on this website are copyright protected.